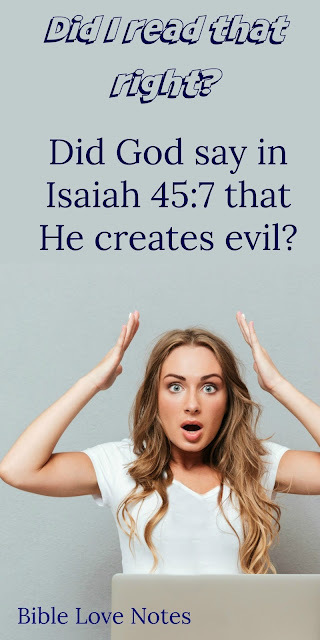 Bite Size Bible Study: Did God Really Say He Creates Evil? Did God Really Say He Creates Evil? By ignoring the rest of Scripture, they concluded that God is responsible for evil. God does create justice through adversity: He punishes unrepentant sinners and refines the faith of His children through adversity. (1) The King James is a good translation, but just like other good translations, it has passages that don't best reflect the original Greek and Hebrew. That's one reason it's good to study several good translations. The original Hebrew and Greek are the most accurate forms of Scripture, but God intended for all languages to enjoy His Word, so we shouldn't get too hyper about translation differences. Many of the Hebrew and Greek words have no equivalent in other languages, so we do the best we can. No translation is "perfect" but all of the major translations are good for reading and study. The King James Version was written before the oldest manuscripts of Scripture were discovered (the Dead Sea Scrolls), so it contains passages not included in the original manuscripts but added later by scribes. These added passages do not contradict Scripture, but the newer translations omit them because they were not part of the original manuscripts. 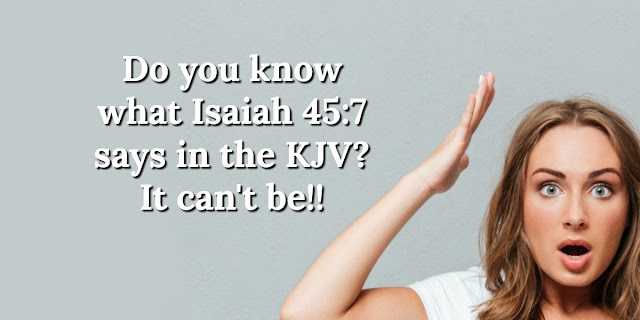 Some people claim that newer translations are less accurate than the KJV due to these missing passages. That's not true. See Isaiah 45:7 in the NIV, ESV, NASB, NLT HERE and GNT, AMP, and NKJV HERE. For more on translations, see: Why Are the Newer Translations Missing Verses?, Missing Bible Verses, Is the King James the Only Reliable Bible? (3) Punishing evil is a good thing and God promises to do so: Isaiah 13:11, Revelation 21:5-8. God also uses adversity to discipline His children so they will turn from sin: Hebrews 12:1-12. And He uses adversity to refine our faith: 1 Peter 1:6-7. (6) There is no darkness in God: 1 John 1:5. God never causes sin: James 1:13. Everything coming from God’s hand is good: James 1:17. (7) See Pieces Parts, Prayer in Context, 3 Ways to Discern Spiritual Truths. 1. Punishment and justice are not highly valued in our modern culture, but they are part of goodness. Situations need not be pleasant to be good. All God does is good, but not all He does is pleasant. Hebrews 12:7-11: Endure hardship as discipline; God is treating you as his children. For what children are not disciplined by their father? 8 If you are not disciplined—and everyone undergoes discipline—then you are not legitimate, not true sons and daughters at all. 9 Moreover, we have all had human fathers who disciplined us and we respected them for it. How much more should we submit to the Father of spirits and live! 10 They disciplined us for a little while as they thought best; but God disciplines us for our good, in order that we may share in his holiness. 11 No discipline seems pleasant at the time, but painful. Later on, however, it produces a harvest of righteousness and peace for those who have been trained by it. See Discipline, Punishment, Condemnation and God Punishes. 2. God is perfectly good, pure, just, righteous, loving. He is never evil, never tempts people with evil and certainly does not create evil. 1 John 1:5: This is the message we have heard from him and declare to you: God is light; in him there is no darkness at all.